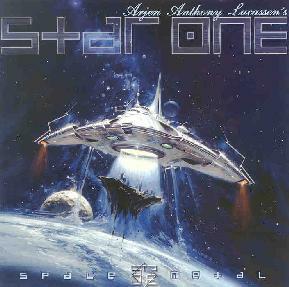 Arjen Anthony Lucassen's Star One - "Space Metal"
Arjen Anthony Lucassen has numerous releases under the moniker Ayreon, and Star One is his latest project. For Space Metal he has assembled a crack team of musicians and vocalists from the prog metal arena including Jens Johansson and Erik Norlander, and singers Russell Allen (Symphony X) and Damian Wilson (Threshold), among others. The songs are all based on science fiction movies and of interest to Hawkwind fans is the the bonus disc that includes a Hawkwind medley that Dave Brock actually participated in. The music on Space Metal consists of thrashing symphonic prog metal. Like most such bands, Arjen's ensemble is so tight you'll never break the knot, the musicianship is top notch, and the vocalists are some of the most powerful singers in the business. The music packs the aggressive punch of Heavy Metal as well as the symphonic majesty of Progressive Rock. The only problem is that there's not a lot that distinguishes these bands from one another. Not to my ears anyway. I mean, it's solid stuff... very slick and polished to such a shine that the aural equivalient of UV rays will get you if you're not careful. But it fits very neatly into the standard mold that prog metal has created for itself. Overall it's a fun and impressive roller coaster ride, but except for it's declared theme the space factor is fairly limited in the music itself. I think it's great that Arjen did the Hawkwind medley but it's on a bonus disc that is a limited edition release of the CD and from what I understand is sold out already. Too bad as that could have been good exposure for Commander Brock. And it didn't come with the review copy I was sent so I can't comment on it. Still, prog metal fans and anyone who loves the Magna Carta label bands will want to run out and grab this as quick as they can because among that genre this is pretty hot stuff. For more information you can visit the Inside Out Music web site at: http://www.insideoutmusic.com. Visit the Ayreon web site at: http://www.ayreon.com. Contact via snail mail c/o Inside Out Music; 344-TB Oakville Drive; Pittsburgh, PA 15220.